Several years ago when I was first exploring the wonderful world of off-camera flash, radio triggering options were very limited with rudimentary capabilities. It's amazing how much the radio triggering market has changed since then. Now, in addition to the basic triggers of ye olden days, we have radio triggers that can remotely adjust the power levels of compatible flashes or even adjust power levels automatically via TTL technology. In other words, there has never been a better time to explore what radio-triggered off-camera flashes can do for your photography. If your current flashes support radio triggering – like the Canon Speedlite 600EX II-RT – then you don't need anything else. However, if your flashes or studio strobes don't feature radio triggering, or if you need to incorporate non-radio enabled flashes into your radio flash setup, then radio flash triggers will be worth looking into. And on that note, there are a few things to consider when arriving at your preferred choice of radio trigger. First, it's important to understand how these radio triggers connect to our shoe mount flashes (and possibly studio strobes). 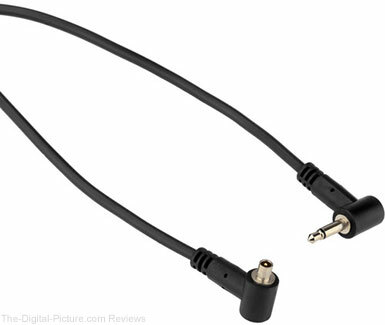 Radio triggers primarily connect to compatible flashes in one of two ways, either by a cable connection or via a hot shoe (and most of those triggers featuring a hot shoe can also trigger via a cable connection). The most common type of sync port found on shoe-mount flashes is a PC terminal. These sync ports have been an industry standard for decades, but... they are not my personal favorite type of connection. First of all, PC cables are not very robust (easily damaged) and they sometimes disconnect from the socket when a flash is handled with the cord attached (though locking PC compatible ports mitigate this issue). A select few flashes feature a 3.5mm (1/8") miniphone sync port, which is very convenient as it's the same sync port that's featured on almost every radio trigger with inexpensive 3.5mm male to 3.5mm male cables being easy to find. A far simpler solution, however, for triggering a shoe-mount flash is to use the flash's mounting foot. Many newer radio triggers feature a built-in hot shoe that your off-camera shoe-mount flash simply slides into. In my opinion, this is the best triggering solution as it eliminates the need for cables which can easily be lost, damaged or simply not long enough (or inconveniently too long) for a specific application. In addition to the type of connection a radio trigger features, it's important to understand whether a specific triggering system is built on separate transmitters and receivers or if a single device can act as both, i.e. is a transceiver. In regards to the separate transmitter/receiver systems (such as Vello FreeWave LR, Radiopopper Nano), a significant pitfall is that is that a single transmitter failure (without a spare transmitter to fall back on) will render all of your receivers completely useless. 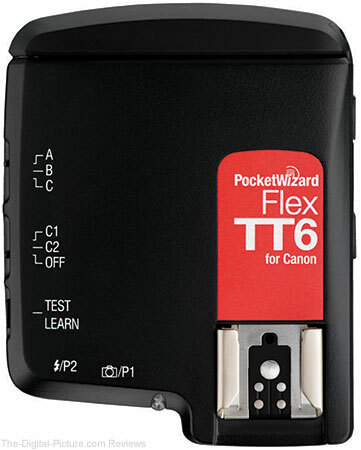 Alternately, a single device failure in a transceiver setup (such as the PocketWizard Plus/FlexTT* or Cactus V6) means that you only lose the ability to trigger one flash, not the entire group, as any of the devices can act as a transmitter. In some cases, a company may even produce radio receivers that are completely compatible with camera brand master flashes or transmitters, thereby allowing the use of older (non radio enabled) flashes to be used in an otherwise radio-enabled setup. One of the primary advantages of radio triggering technology is that it eliminates the line-of-sight requirements for trigging off-camera flashes as well as boosting the range even if line-of-sight positioning of flashes is possible. For instance, Canon Speedlite's optical flash triggering system has an advertised range of 32.8 ft (10m) outdoors and 49.2 ft (15m) indoors. And technically speaking, line-of-sight isn't always required indoors if surfaces are available for the master flash's transmission to bounce off of in order to communicate with slave flashes. Now contrast the previously mentioned optical triggering range with that of typical radio triggers advertising anywhere from 300 ft (91.4m) to 1,600 ft (487.68m). Suffice it to say, most photographers will never need to trigger an off-camera flash from 300+ ft away, but... it's nice to know that your flash will fire when you need to position it in a location that exceeds the capabilities of optical triggering. Another thing to consider when shopping for radio triggers is the likelihood of the brand remaining in the radio triggering market for the foreseeable future and whether or not they have displayed a commitment to backwards compatibility with previous generation devices. One example, PocketWizard, has been producing flash triggers for more than 15 years with newly released products always being backwards compatible in terms of radio frequency. In regards to radio flash triggers, there are basic triggers and advanced triggers. Basic triggers transmit/receive only one highly relevant piece of information – FIRE! Because they are relatively easy to design and manufacture, there are a wide range of companies that produce these very-easy-on-the-budget triggers. While most of the triggers will work as intended most of the time, you may experience or occasional misfires and you'll likely forego high build quality with flash triggers at the lowest tier pricing level. Examples of basic triggers include the PocketWizard PlusX, Radiopopper Nano, and Yongnuo RF-603C. Not all advanced triggers feature all of the capabilities listed above, but most offer at least some of them. The extra features of advanced triggers compared to basic triggers come at a higher cost, of course, but the price differential translates to significantly increased convenience and versatility. Examples of advanced flash triggers include the PocketWizard FlexTT*, Phottix Laso, Cactus V6 and Yongnuo YNE3-RX . Which radio trigger is right for you? If you're just exploring off-camera flash for the first time, it's probably a good idea to invest in a set of basic triggers. Why? Because all of the extra features afforded by advanced triggers can complicate the off-camera flash learning process. Basic triggers require manual flash power adjustments and therefore simplify the "cause and effect" learning process. Once basic lighting principles have been conquered, the value of the advanced triggers' full feature set can be fully appreciated. Then again, nearly all advanced radio triggers can replicate the functionality of basic triggers. So if you're ready to jump down the rabbit hole, but still inexperienced with off-camera flash, you can invest in an advanced flash trigger system and use them as basic triggers until you're ready to explore the augmented feature set. Why Do I Need an Off-Camera Flash?